June 7, 2016 – Science, Space, and Technology House Committee Chairman Lamar Smith and Space Subcommittee Chairman Brian Babin (R-Texas) yesterday sent a letter to U.S. Department of Commerce Secretary Pritzker on the National Oceanic and Atmospheric Administration’s (NOAA) lack of decision on granting DigitalGlobe a license to operate a space-based remote sensing system. The Land Remote Sensing Policy Act of 1992 requires Secretary Pritzker to review and make a determination on any space-based remote sensing system license applications or inform the applicant of any pending issues. “According to recent press reports, commercial satellite imagery provider DigitalGlobe is still awaiting a license approval to sell high-definition infrared imagery data from its Worldview-3 satellite almost three years after submitting the initial request, well beyond the 120 day requirement,” the letter states. Chairmen Smith and Babin request that NOAA provide communications and documentation confirming DigitalGlobe’s application date, a timeline of the application review process, names of NOAA employees involved in the application approval process, and an explanation of why NOAA has so drastically prolonged and delayed the process. Yesterday’s letter is part of the Committee’s ongoing oversight of NOAA’s licensing of private space-based remote sensing systems. 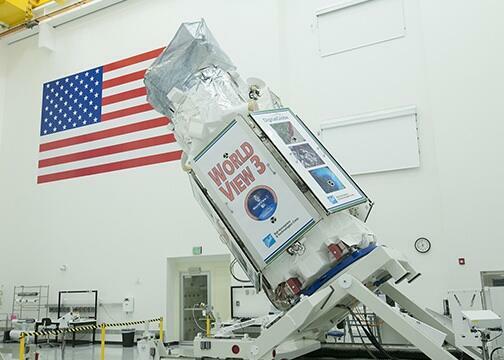 WorldView-3 is the first commercial satellite to feature high-resolution shortwave infrared bands that allow accurate imaging through haze, fog, dust, and smoke. It provides unprecedented views of Earth that can aid climate study, disaster and humanitarian relief, defense and intelligence applications, and many commercial industries. DigitalGlobe, headquartered in Westminster, Colorado, worked with Ball Aerospace & Technologies Corp. to build WorldView-3. Exelis built the satellite’s imaging payload, and it was launched by Lockheed Martin Commercial Launch Services on an Atlas V rocket provided by United Launch Alliance (ULA).